For all your information about the stunning theatres and various venues for entertainment we offer you direct information about the hottest spots in town. There is something for everyone, so whatever is your thing, you’re definitely going to find a spot suited for you. Stadsschouwburg – At the night-time epicentre of town, the Leidseplein, this one building stands out from all the surrounding pubs and terraces. This theatre would have to be one of Amsterdam’s most precious buildings of the late nineteenth century. Built in a Baroque style, the main hall is decorated with statues, ornaments, and chandeliers in an attempt to excite the spectator whilst waiting for a show. There are plays from all sorts of disciplines and some of the ones in Dutch are even provided with subtitles, however that may happen. An inside tip: on Wednesdays during lunchtime there’s a free entrance to rehearsals. Stadsschouwburg, Leidseplein 26. 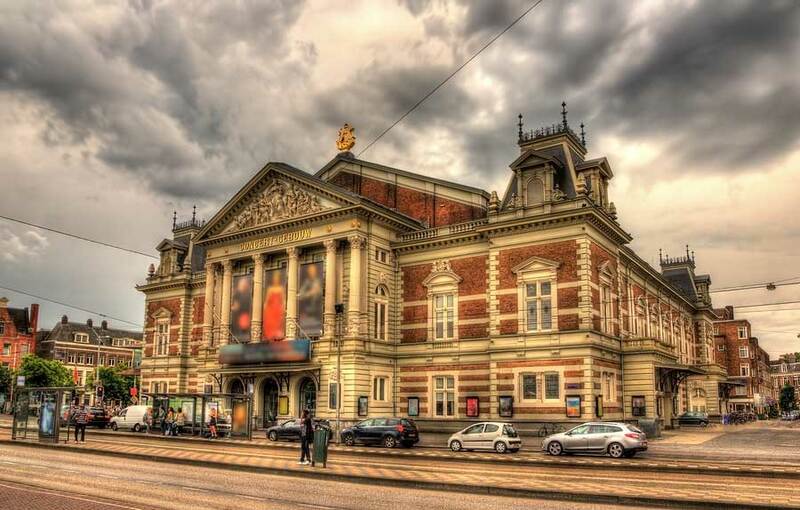 Concertgebouw – A wonderful piece of architecture stands tall at the same city square as the Rijksmuseum and the Van Gogh Museum, the Museumplein. The concert building is known to have some of the world’s best acoustics. On Sunday mornings it is absolutely spectacular to listen to Holland’s renowned orchestras playing classical music from Mozart to Bach. A music concert here is an experience you will remember forever. Concertgebouw, Concertgebouwplein 2. DeLaMar – The DeLaMar Theatre building offers a variety of entertainment including movies, caberet, and musicals. The modern setting of this theatre is worth a visit alone. You can also just pop in for a drink at this amazing establishment. Musical concerts are also held here. DeLaMar, Marnixstraat 412. Paradiso – This renovated church nowadays acts as the main modern music concert building in Amsterdam. The complex is simply fantastic and the vibe inside is electric. You can dance downstairs with fellow admirers of the performance on stage or go up the stairs and enjoy sitting at the balconies overlooking the entire ground floor and the stage. You might even find your favourite artist showing up here for a performance or just a dance. Paradiso, Weteringsschans 6. Melkweg – Right around the corner of Paradiso just alongside the vibrant nightlife area of the Leidseplein you can find this pop stage. This concert building basically forms the main alternative for Paradiso so compare both agendas and you will surely find something you like. Melkweg, Lijnbaansgracht 234. Pathé Tuschinski – If you want to go to see a popular movie you should definitely try to score some tickets at this historical place with a unique decoration you will not find in modern cinemas. It’s located just around the corner of Rembrandtplein so afterwards you can have a drink at one of the many bars at this city square. Pathé, Reguliersbreestraat 26. Boom Chicago – This comedy theatre offers daily comedy shows, mostly improvised. Stars like Seth Myers started their career here and the entire crowd always has a great time. It’s always in English so you can buy a ticket every day and be entertained. You can even have dinner here and make a complete night out of it. Boom Chicago, Leidseplein 12.